Most entrepreneurs are usually running after entrepreneurs to fund their ventures, but Ola CEO Bhavish Aggarwal is reportedly reluctant to accept a cool $1 billion — and from Softbank, no less. Ola CEO Bhavish Agarwal is unwilling to accept the full $1 billion (Rs. 7,000 crore) that Softbank wants to invest in his firm, ET reports. 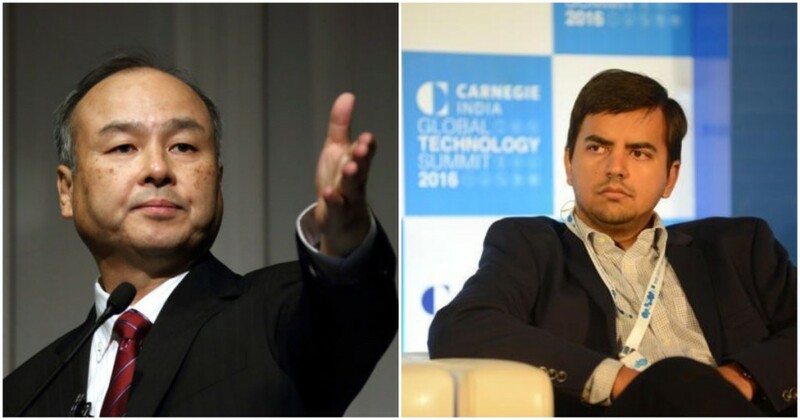 “(Softbank CEO Masayoshi) Son and Aggarwal have met multiple times recently but taking such a big amount from SoftBank has an imminent risk which Ola wants to avoid,” a source reportedly said. Aggarwal is wary of accepting the full $1 billion from Softbank because it will likely give the Japanese VC giant too much control over the company he founded. Softbank was one of Ola’s early investors, and currently owns 26% of the company. After investing a further $1 billion, Softbank’s stake in Ola will likely go up, and this could lead to Softbank dictating the direction in which Ola is run. With founders Bhavish Aggarwal and Ankit Bhati together holding a shade over 20% of Ola, they could soon be forced to cede control of Ola to Softbank. And Softbank is seen to be an entity that’s not averse to throwing its weight around when it calls the shots. In 2015, Softbank had used its board seats in Housing.com to dismiss CEO Rahul Yadav from the company he’d founded. In 2017, Softbank had lobbied hard to merge Snapdeal with Flipkart against the wishes of Snapdeal’s founders, but hadn’t succeeded. Ola’s founders have previously made moves to prevent such an eventuality. In 2017, Ola’s founders had created a new Articles of Association agreement to prevent a takeover from Softbank. The agreement had said that SoftBank, in particular, could not buy more equity shares in Ola without approval from the company’s founders and board of directors. Additionally, any transfer of equity shares by Ola investors representing 10% or more of the company’s capital would need to be approved by Aggarwal and Bhati. Indian founders have only now wised up to the degree of control that they give up when they raise money from outside investors. Apart from Rahul Yadav, Flipkart founders Sachin Bansal and Binny Bansal also have also been forced to leave their companies, chiefly because of the wishes of their largest investors. Sachin Bansal had even gone on to say that Indian founders needed more control over their companies after leaving Flipkart, and suggested founders start using dual-class voting shares. Below 25% stake, entrepreneurs usually do not have much control on the main decisions, including mergers, unless separately agreed upon. Below 10%, which is a reality in many startups at late stage, founders can also be booted out,” he’d said. Interestingly, Bansal is now considering investing as much as $100 million into Ola. While it’ll be hard to say if it was his personal nudge which prompted Ola’s founders to be wary of a Softbank investment, but they sure seem to have taken his philosophy to heart.